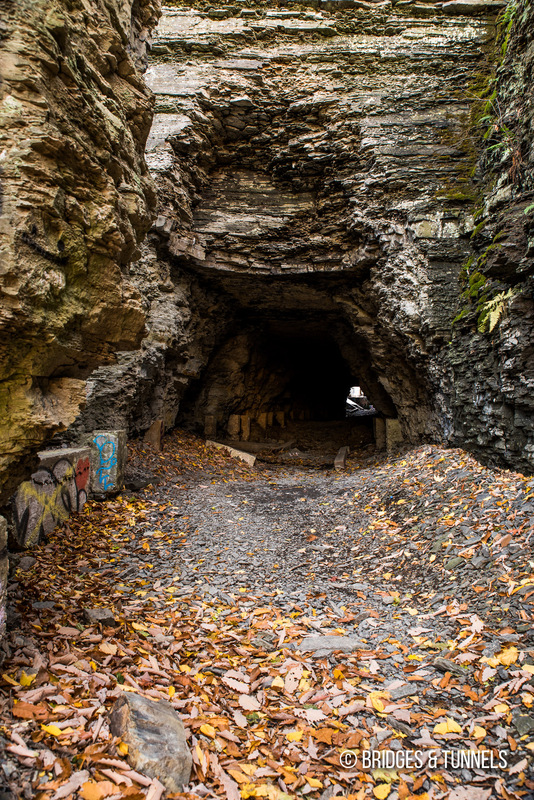 Ezra’s Tunnel is a circa 1832 waterway tunnel that fed into a raceway which provided power for much of Ithaca, New York’s early industry. View towards the eastern portal. View of the eastern portal. A view of Fall Creek at the eastern portal looking upstream at Falls Creek. The earliest of industries in Ithaca, New York was centered around Fall Creek due to the powerful and consistent flow of Ithaca Falls. 3 Grist, plaster, oil and woolen mills, and iron foundries were all established in cluster along the creek which by 1828, produced enough goods to load 396 canal boats to ship along Cayuga Lake and Erie Canal. One of the earliest industries to locate along Fall Creek was an oil mill constructed by Frederick Deming and Jonathan Thompson circa 1817 just east of the present-day Lake Street bridge. 3 Porter added a whiskey distillery in 1820. The oil mill produced vegetable oil from corn by a heat extraction process, the by-product of which was used as mash for whiskey production. Around 1827, the distillery was leased to Gere and Gunn. Above the oil mill and distillery was a saw mill owned by Phineas Bennett. 3 It was constructed circa 1813 and rebuilt around 1816. 3 A circa 1822 small foundry was located next to the mill, owned by Origen Atwood and Sylvester Roper. Further up, beyond a dam across Fall Creek, was a circa 1814 plaster and grist mill, also owned by Bennett. A carding room, to process wool, was later added. The plaster mill was vital because it provided a material that was in short supply following the War of 1812, when the United States lost access to gypsum from Canada. 3 The gypsum processed by the mill was mined locally. The plaster mill and carding room was sold in 1819 to Barney McGoffin and Ansel Bennett and then to George Blythe in 1820. 3 It was maintained as a wool carding and cloth dressing factory until 1825. In 1827, Gere, Gunn and Nichols leased the mill and resumed manufacturing plaster, and by 1835, the plant was producing 800 tons of goods annually. Upstream was the Olympic Falls Flouring Mill which originally operated via an overshot waterwheel, was fed by a wooden flume overhanging Ithaca Falls. 3 The plant was purchased by Jeremiah S. Beebe in 1827 who rebuilt it. Beebe hired Ezra Cornell to manage it. 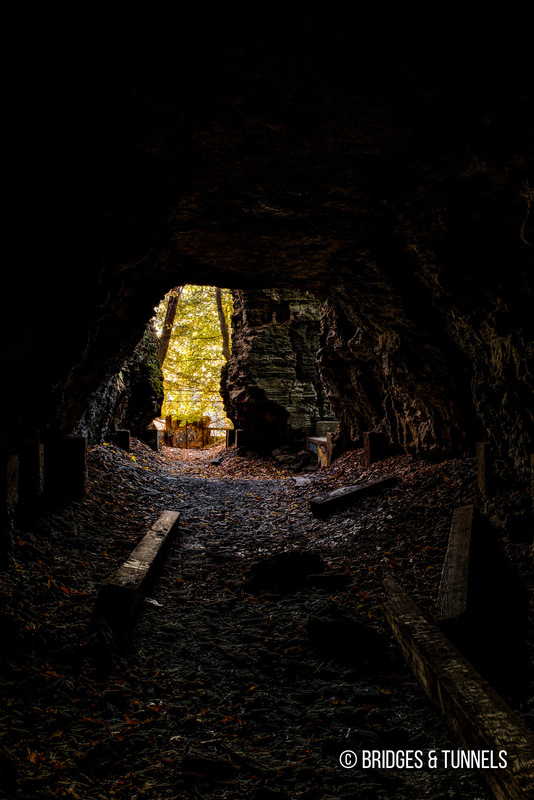 In 1828, Cornell began construction of a 200-foot long, 12-foot high, 13-foot wide tunnel along Fall Creek to bypass Ithaca Falls and channel water through a raceway for the mill. 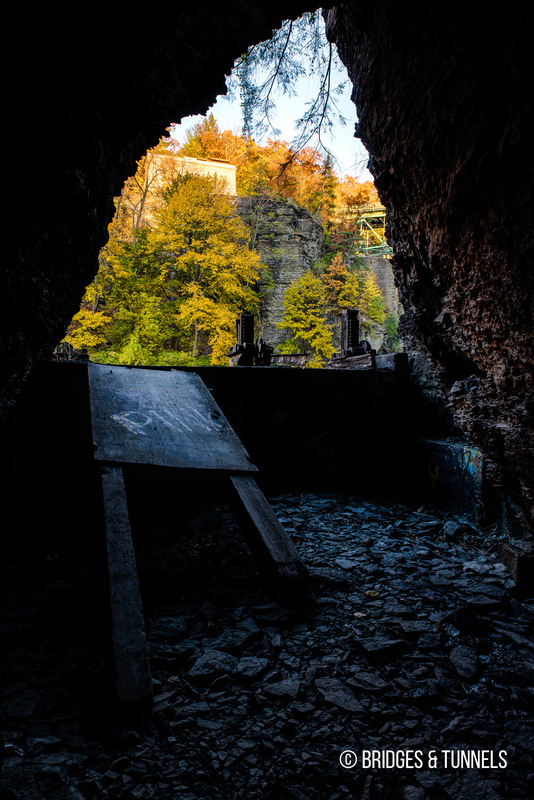 3 The tunnel, and a low-rise dam at the top of Ithaca Falls, was completed in 1832 at which point the wooden flume was dismantled. By 1835, Beebe’s gristmill was producing 40,000 bushels of wheat annually. The Ithaca Falls Woolen Manufacturing Company bought Olympic Falls Flouring Mill in 1840 and enlarged the building to five stories, converting it to manufacture woolen cloth. 3 A fire destroyed the business in 1851. A new three-story grist mill was constructed on the site in 1854 by Henry Walbridge which soon failed. It was purchased by Albert M. Hull who operated the Fall Creek Milling Company, grinding 200 bushels a day using power supplied by two waterwheels from the raceway. It ceased operations in 1926 when the property was sold to Cornell University. The mill was soon demolished. Further upstream was the county’s first paper mill, constructed in 1819 by Otis Eddy and Thomas S. Matthewson, which produced writing and printing papers and brown wrapping paper. 3 The part of the mill which manufactured writing and printing papers was known as the white mill, which burned in 1846. It was rebuilt further up the creek by Ebenezer Mack and William Andrus only to be rebuilt again in 1851 further upstream. In 1954, the Ithaca Paper Company closed after 130 years of operation. Adjacent to the paper factory was a tub and firkin factory owned by Beebe, which produced pails, tubs, keelers and measures, a chair factory owned by Barnaby and Hedges, and Ithaca Furnace, a foundry established in 1828 at the foot of the raceway. 3 The foundry, owned by Dennis and Vail, produced mill gearing, railroad castings and finished goods. Further up the creek was Ithaca Agricultural Works, established in 1867 to manufacture farm equipment. 3 The company reused the Ithaca Furnace building for their foundry, producing iron castings. A woodworking shop, paint room and a brick office building was also constructed. Ithaca Agricultural Works failed in 1879 and was reorganized as the Ithaca Manufacturing Works. That company, too, failed circa 1889. O’Toole, Molly. “Gun Factory Building Has Hazardous History.” Cornell Daily Sun [Ithaca], 28 Nov. 2007. Brokaw, Josh. 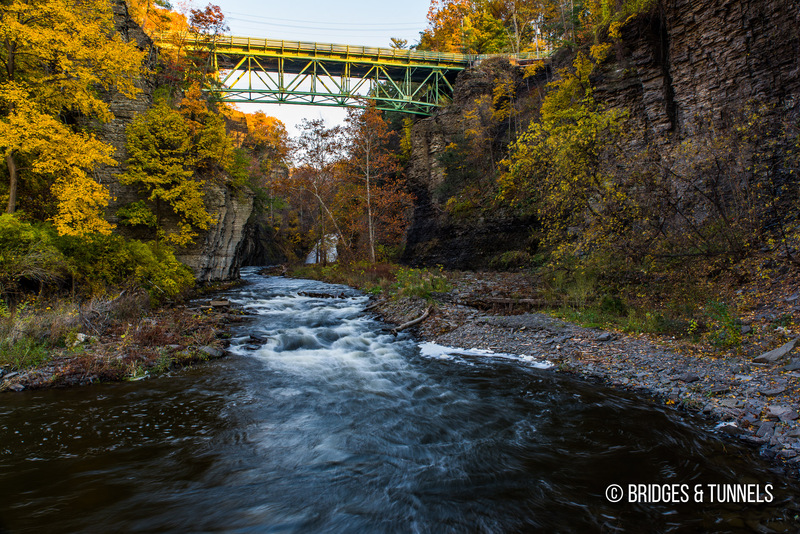 “Get the Lead Out: Ithaca Falls Still Contaminated.” Ithaca Times, 14 Oct. 2015. Humber, Amy. “Fall Creek.” Ithaca’s neighborhoods the Rhine, the Hill and the Goose Pasture, by Carol U. Sisler, Ithaca, DeWitt Historical Society of Tompkins County, 1988, pp. 39-44.